Regenerating skin care oil for combination and sensitive skin. 30 ml bottle. 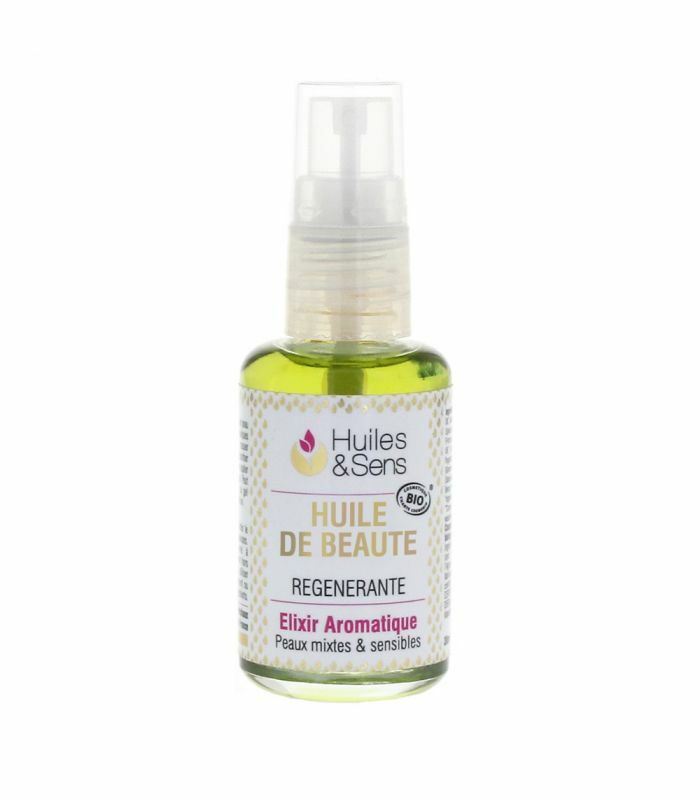 This skin care oil is composed of all essential and vegetable oils, described below, known for the following properties: Soothes and regenerates the skin cells. The Rosehip virgin vegetable oil (rosa rubiginosa): Rich in polyunsaturated fatty acids and A vitamins (retinol), it is efficient to fight the effects of aging. On top of its cell regenerating properties (anti-wrinkle), this oil heals and cicatrizes (burns, sunburns, acne and rosacea). It nourishes the skin deep inside and softens the skin tissue (anti-stretch marks). The Apricot kernel virgin vegetable oil (prunus armeniaca rosaceae): Rich with vitamins and minerals, it is ideal for prematurely aged, dry or sensitive skins. The Jojoba virgin vegetable oil (simmondsia chinensis): Both hydrating and moistening, it gives the skin a soft and silky aspect. It successfuly treats acne, eczema, psoriasis and skin inflammation. The Roman chamomile essential oil (chamaemelum nobile): It softens dry skins, soothes itching and attenuates the irritation of sensitive skins. Its anti-allergenic properties makes it efficient for skin allergies (dermatitis, hives, eczema). Last, it is anti fungal and bactericid (prevents and destroys infections), anti-inflammatory (anti-redness) and helps cicatrization. The Lavender essential oil (lavandula angustifolia): Antiseptic, cicatrizing and a skin regenerant, It is one of the most recommended essential oils for epidermis and skin care. It is very well tolerated and one of the rare essential oils that can be directly applied to the skin (in case of a burn, for example). The Myrtle essential oil (myrtus communis): Powerful anti-wrinkle and tonifying, it is also efficient for soothing irritated and inflammated skins and to fight acne or psoriasis. It is suitable for greasy skins. Vitamine E : A natural anti-oxydant, it also atenuates scars. The association of these oils creates a powerfuil synergy (mutual re-inforcement of the properties of each of the formula individual components) for the benefit of your beauty. Usage: Facial oil for fragile or dammaged skins. Also suitable for night care. How to use: Apply preferably on a perfectly cleaned, wet skin. Use a small quantity and massage it with the tips of the fingers. For very dry skins, apply in the evening and leave it for the night. Avoid contact with the eyes. All essential and vegetable oils, described above, are 100% pure and natural. Skin care oil in 50 ml white glass bottles with spray pump.